With funding from the United Sates Agency for Internatonal Development (USAID), EnterpriseWorks/VITA (EWV) has been working with farmers in the Southern Highlands of Tanzania, helping them to increase their incomes by producing higher value crops. For the first time ever, this past April EWV was able to assist a group of these farmers export 5.8 tons of Tanzanian avocados to England where they were successfully sold to leading super market chains including Tesco, and Marks and Spencer. Incomes for participating farmers grew from $0.14 per kilogram for local product in the local markets to $0.50 per kilogram for the improved variety of Hass Avocados in the wholesale market While the earnings from this first shipment were a modest $16,820, a market study indicates that given the quality of the product and the anticipated yields, producers should earn more than $107,000 in 2010, double that in the 2011 growing season, and be earning an expected $1 million by 2015. To ensure success, EWV worked closely with Mack Multiples, the United Kingdom’s leading fruit importer, to facilitate the design and development of a quality management system (QMS) and facilitate the necessary global certifications required to export the avocados to the European market. The farmers became certified in a variety of programs including including Global Good Agricultural Practices (GAP), Tesco’s Nature’s Choice, Marks and Spencer’s Field to Fork (F2F), and LEAF (Linking Environment and Farming) – a first for Tanzanian horticulture. “This effort is an innovative example of how private sector partners and small farmers have teamed up within the avocado value chain to produce and sell a first rate product that promotes the highest enviromental and ethical standards” said Michael Fredericksen, EWV’s Country Director. 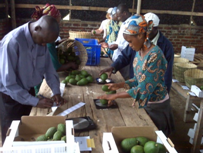 The end buyers (Tesco, Marks & Spencer, and Sainsbury’s) were quite impressed with the quality of the Tanzanian avocados and reported that they compared well or better quality than supplies they were sourcing from Morocco and Peru. Given the success of this first shipment and with the support of USAID and Mack Multiples, EWV’s plans are to help even more farmers get certified over the coming year, increasing the volume of exports and the resulting incomes to the Southern Highland farmers participating in the effort.